Hello and happy Monday! Just quickly stopping in to share a little glittery goodness with you guys... These cute butterflies are from the With Sympathy set, stamped onto punched circles. 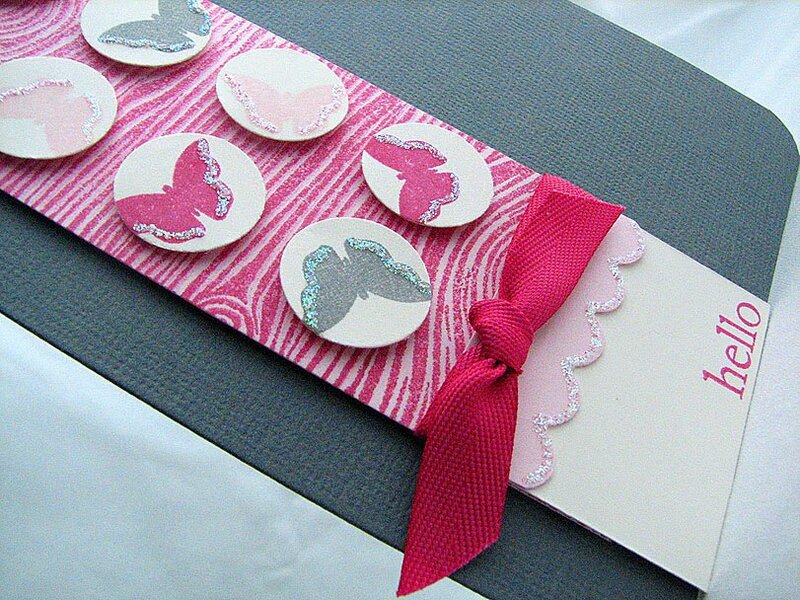 Then, with dimensional adhesive, layered over some raspberry fizz woodgrain stamped over light pink cardstock. Wrapped raspberry fizz twill ribbon around a scalloped edge, stamped the sentiment, then added a touch of glitter glue. Hope you have a great start to your week! Thanks for visiting! This is positively amazing! 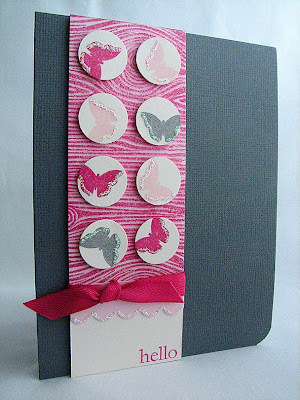 Love the colours and the circle punched butterflies. The glitter glue ads a wonderful soft touch. wow! fabulous design! love this!! This is just lovely lovely lovely!!! Wow, amazing girl! soooo sweet, Maile. that touch of glitter is wonderful and what a fabulous layout! Very lovely!! Where are you these days?? I haven't heard from you in a while! :) Just checking in on you!! This card is gorgeous! I just love those butterflies mixed with the woodgrain! Adorably cute! Love the card design and glitters!